Honesty (Lunaria annua): growing, planting, caring. Loved for its cute translucent disc-shaped seedpods. 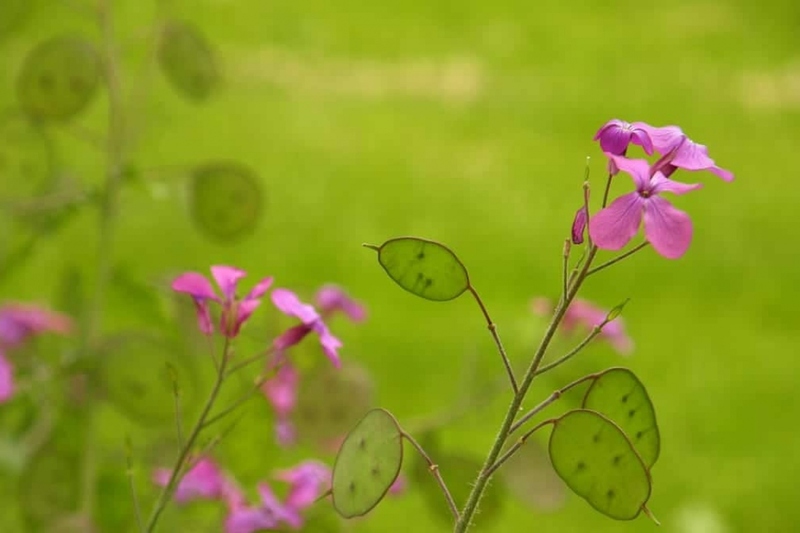 Lunaria annua - honesty or annual honesty in English - is a species of flowering plant native to the Balkans and south west Asia, and naturalized throughout the temperate world. It is an annual or biennial growing to 90 cm (35 in) tall with large, coarse, pointed oval serrated hairy leaves. In spring and summer it bears terminal racemes of white or violet flowers, followed by showy, light brown, translucent, disc-shaped seedpods, the skin of which falls off to release the seeds, revealing a central membrane which is white with a silvery sheen, that persist on the plant through winter. A pink-violet bloom that then produces fruit with original shapes - in a coin! - to compose very decorative dry bouquets. The honesty is sown in June, in nursery. It also reseeds itself in the fall, where the seeds fall. If your seedling was too thick, thin it a little so that the small seedlings do not interfere. When the seedlings have two or three leaves, you can transplant them into a soil that is also prepared and kept moist, but this intermediate transplanting is not essential. If you decide to do it: gently separate the seedlings and replant individually in a bucket filled with transplanting soil, or a mixture of soil and well-decomposed compost. Then water copiously at the plantation, then every day during the first weeks. If you did not sow them directly in open soil, about two months after sowing, the plants took enough strength to be placed in open soil. Money plant prefers a sunny location in temperate or semi-shaded areas in warm regions. It enjoys a rich, fresh soil, well drained and if possible enriched with a manure fertilizer. Plant them in finely worked beds (spaded, scratched and raked), checking that the last spring frosts are overdue. Once the area is properly prepared, simply make a small hole with a dibble, remove the plant from its bucket, put it in the hole, and compact the soil to put it in contact with the roots. Respect a spacing between the plants corresponding to one third of its intended width. Water copiously to facilitate rooting. In pots: opt for a pierced pot to ensure good drainage. Line the bottom of the pot with clay balls or gravel. Fill half of the pot with potting soil. Arrange the plants with a space of 15 cm between them. Cover with potting soil, tamp well and water. After the wilting of the plant in the second year, in the autumn, it is useless to leave the biennial in place, so it must be pulled out, for example to leave room for spring bulbs. The lunar reseeds easily provided the flower stalks aren't trimmed before, conversely if it is invasive, cut half or 3/4 of the flower stems to limit the spread of seeds.